Overall, Muslim Americans have a generally positive view of the larger society. Most say their communities are excellent or good places to live. A large majority of Muslim Americans believe that hard work pays off in this society. Fully 71% agree that most people who want to get ahead in the U.S. can make it if they are willing to work hard. The survey shows that although many Muslims are relative newcomers to the U.S., they are highly assimilated into American society. On balance, they believe that Muslims coming to the U.S. should try and adopt American customs, rather than trying to remain distinct from the larger society. And by nearly two-to-one (63%-32%) Muslim Americans do not see a conflict between being a devout Muslim and living in a modern society. Muslim Americans reject Islamic extremism by larger margins than do Muslim minorities in Western European countries. However, there is somewhat more acceptance of Islamic extremism in some segments of the U.S. Muslim public than others. Fewer native-born African American Muslims than others completely condemn al Qaeda. In addition, younger Muslims in the U.S. are much more likely than older Muslim Americans to say that suicide bombing in the defense of Islam can be at least sometimes justified. Nonetheless, absolute levels of support for Islamic extremism among Muslim Americans are quite low, especially when compared with Muslims around the world. A majority of Muslim Americans (53%) say it has become more difficult to be a Muslim in the U.S. since the Sept. 11 terrorist attacks. Most also believe that the government "singles out" Muslims for increased surveillance and monitoring. Relatively few Muslim Americans believe the U.S.-led war on terror is a sincere effort to reduce terrorism, and many doubt that Arabs were responsible for the 9/11 attacks. Just 40% of Muslim Americans say groups of Arabs carried out those attacks. International comparasions show the US and France as closest, which bolsters the assimilationist case. On broader policy American Muslims are liberal on economic policy but socially conservative rather like African-Americans overall (who make up the largest group of American-born converts). crucial personal dimension in a period of national discontent, is whether the candidate is seen as an agent of change. And at this early stage in the game, the Republican front runners might just fill that bill. A recent Pew survey found that most voters make a big distinction between both John McCain and Rudy Giuliani and President Bush. Both candidates are seen as less conservative than Bush, and much closer to the average voter's own political beliefs. ..Another piece of evidence for the potential appeal of the Republican frontrunners is the support they draw from political independents--the group that was so eager for political change in 2006, and played a decisive role in the Republican congressional defeat. A recent Pew poll found that as presidential candidates both Giuliani and McCain were about as appealing to independents as were Clinton and Obama, even though a plurality of independents say they lean Democratic these days...Of course, the very appeal of Giuliani and McCain as more centrist and politically distant from Bush threatens their viability in the GOP state primaries races where independents are often barred from voting and voters with strongly held conservative beliefs are most likely to turnout. Indeed, Republicans in Pew's survey placed themselves very close to President Bush on the liberal-conservative continuum and quite a bit to the right of where they placed the candidates they now say they are most likely to support for the Republican nomination...The message of the horse race polls for the Republican Party may be that while McCain, and Giuliani might be perceived as insufficiently conservative for a majority of GOP voters, ultimately only they, or someone else with centrist appeal, may be able to hold off the broad advantage the Democrats have going into this election. For the Democrats, the message may be that, while there is broad discontent with Bush, which has hurt his party, their own potential nominees are not so strong that they can rule out being beaten by a Republican who is seen as an agent of change. Could Peter Costello appear as an agent of change? Not usually in business of critiquing newspaper articles and the obsessive pursuit of right-wing MSM commentators by lefty bloggers but even I was struck by the Gerard Henderson column this week and Paul Kelly's contribution. Paul Kelly's The End of Certainty highlights Henderson's influential role in Liberal policy formation in the 1980s as Howard's Chief of Staff and his coining of the term 'industrial relations club'. Henderson left Howard's staff in 1986 because he felt Howard was too indecisive on industrial relations. Both Henderson and Kelly have suffered the experience that Communists were once familiar with, being left down by their favoured foreign government. The Hicks plea bargain reveals that the US has made up policy as it went along. Both Henderson and Kelly retreat to the ground of criticising Hicks' defenders, Kelly at least tries to balance this by some vague criticism of the Australian government but also bewails 'purist line of the human rights lobby'. Henderson at the end of his column admits: 'The Howard Government could have better handled the Hicks matter', if so how? Both Henderson and Kelly somehow think that wrong statements by individuals they dislike are somehow equivalent to real physical actions by the agents of governments. It encapsulates the view of politics as a verbal debate disconnected from the real worlds of human experience. Most supporters of the Iraq war have retreated to scouring the comments of the war's opponents for those they can criticise, they are sometimes successful in this, but making a foolish, or even a morally repugnant statement, is not the same as taking an action those real consequences for flesh and blood humans. What we see is a tendency to blur the distinction between perceptions and reality, so Greg Sheridan can note Al-Qaeda’s success in constructing a global narrative of Islamic victimisation but then attribute this success to the malign influence of ‘pro-terrorist’ Western commentors. The dichotomy between the continued run of favourable polls for the ALP and the perception of many press gallery journalists that the government has begun its fight back with a politically clever budget, aided by the ALP’s alleged disarray on industrial relations has provoked much excitement among bloggers. Some of this excitement seems a reliving of Kevin Rudd’s election triumph even before it has occurred, but it is an instalment in the ongoing battle between the ‘mainstream media’ and bloggers, which is longstanding in the US. Been thinking about these issues whilst reading the greatest monument of the MSM: Paul Kelly’s The End of Certainty. It is a work relentlessly devoted to arguing for a particular set of polices as desirable. The Australian’s extraordinary crusade against Labor’s IR policy is in this tradition. But Kelly’s book is also an exercise in high politics, ordinary voters appear only in focus groups, in particular his discussion of the shift to enterprise bargaining ignores the problems of worker resistance to the wage restraint of the 1980s. The book’s elite focus supports my view that one reason for the gallery’s view on IR is a resentment of social actors from outside their narrow world, this is why both the Greens and One Nation received such media hostility, because neither were inclined to accept press gallery advice, to a degree the National Party suffers from this. Nevertheless it passes the test of being a worthwhile book, it is a valuable source of information. The IR debate reminds me of how Hawke’s promise to protect Kakadu was a vote-winner despite being disparaged by the media. We see too that Howard was not always a political genius. It does remind us that governments can come from a long way behind, Labor’s 1987, 1990 and 1993 victories could all have been defeats. In part the gallery is aware that public opinion can change. It would be useful if more examples than 2004 and 2001 were considered. My view is intermediate between the MSM and the bloggers, high support for Labor reflects both perceptions of which party is best to deal with particular issues and which issues are prominent in voters’ minds. As the election approaches economic management will gain a higher profile, this will benefit the government, but its advantage over Labor has shrunk noticeably. Are private sector managerial-professional voters (a group which has shifted rightward since 1996 as I show here (third article)) more concerned with IR or with broadband? Voter perceptions on party performance are slow to change. The Coalition’s attempts to reverse perceptions on education and the economy are unlikely to be successful. It is not that voters have stopped listening to the government, in fact they never listen much, circumstances have changed. Much of the discussion of Tony Blair's departure fails to place his government in the context of political history. In the 1940s politics in Europe shifted fundamentally to the left, due to the prestige of the Soviet Union and the perception that pre-1939 capitalism had been a failure. In the late 1960s and early 1970s there was another leftward shift. In both cases conservative parties anxiously sought to accommodate themselves to the leftward shift, and they tried to seek justification for this pragmatic accommodation in aspects of their core doctrines. Thus reformist British Tories blamed Whigs for laisser-faire, whilst in the early 1970s the Australian Liberals as Denis White and David Kemp (see his essay in here) complained took up concepts of positive freedom to justify support for an expansionist state in social policy. Since the mid 1970s however the centre of gravity on economic policy has shifted to the right. In Britain this shift was particularly marked, reflecting a broader shift in public opinion (discussed here) due to the disappointments of the 1970s. 1979 in Britain was a turning point, like 1980 in US (and 2007 in France?). Of course this has not meant a minimal state, public expenditures levels have remained high and contrary to some silly arguments economic policy has not converged across developed countries. Thus pragmatic politicians followed this centre to the right, in the case of British Labour the shift has been most apparent given the party's early 1980s leftism (for the obverse of the majority shift to the right in the 1970s was a minority radicalisation), electoral defeat and the general zeitgeist contributed to a general demoralisation, but the centre on other policy areas has shifted to the left and New Labour followed this, devolution and human rights legislation were seen as dangerously radical by the Labour moderates of the 1970s. Blair is particularly prone to justify pragmatic centrism by extravagant rhetoric (see his works here and here), hence his arguments that the Third Way was not a shift to the pragmatic right on economic policy. The events of the 1970s traumatised the British political class, and made the reduction of trade union power a policy that attracted consensus support, even if in Labour's case after the fact. Even Blair’s view that Thatcherism had economic achievements to its credit was anticipated by some British Marxists who saw in Thatcherism not crazed economic irrationality but an attempt to restore the conditions for capitalist accumulation. Even the extravagance of Third Way claims to represent all interests, except a few old thinkers, is shared by the revolutionary left’s implausibly broad definition of the working class. I wonder if I'm alone in my conflicted view of all this. I am all for democracy and for the military keeping its nose out of politics. On the other hand, there is something I like about a political order which has secularism as; you'll forgive me, an article of faith. Perhaps we can resolve this contradiction by recalling the Marxist critique of capitalist democracy, to Marx socialism would be a radicalised democracy that would enable humans to fulfil their full potential through collective self-government. We are not obliged to support capitalist democracy when it reduces the ability of hums to fulfil their full potential. Democracy, as James Bryce noted long ago, has won support as a means to an end. We can however be sure that Communism was a massive regression on capitalist democracy. We cannot be 'all for' democracy as currently constituted. 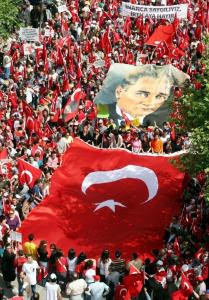 More secularist protests in Turkey (picture from here). Once again they seem to have attracted little attention in Australia. media coverage tends to point the Islamist's success in attracting lower income voters, although I suspect the division is driven by region and history, and success in on the ground campaigning and the provision of social services. One revolutionary left interpretation is simply to dismiss the demonstrators as evil educated middle-class people. Adherents of this seem to be a minority on LBO however. Interesting article in New Left Review on Turkey by Cihan Tugal that shows the Islamists' political success based among other factors in the discrediting of the old parties. The problem is that the secular nationalist project is exhausted, Nasser and Ataturk no longer offer guidance in the present, and as Tugal shows the Turkish army has a very dubious record. The hint of military intervention can be compared to those on the Australian left, such as new NSW Labor MP Verity Firth who argued last year that a Bill of Rights in NSW would provide a protection against anti-union initiatives by a conservative government. This is weak shield indeed, what the left needs to do is to develop social institutions and widely shared social values that will ensure that any conservative government is constrained. Federal Labor shows little sign of this. Its proposed Fair Work Australia would presumably be abolished by a conservative government; a reinvigorated Industrial Relations Commission would have more prospect of survival.